SUTTONS BAY: The Front Porch in Suttons Bay is celebrating 40 years of fun on Saturday, May 6 from 9:30 a.m.–5:30 p.m. To celebrate and thank local clientele for their many years of loyalty, there will be sales throughout the store, which is full of fresh new items for spring and summer. The store originated in 1977 with Jim and Bobbie Eggert selling handmade Christmas stockings and hand-carved wooden letters from ‘the front porch’ of their home in Leland. 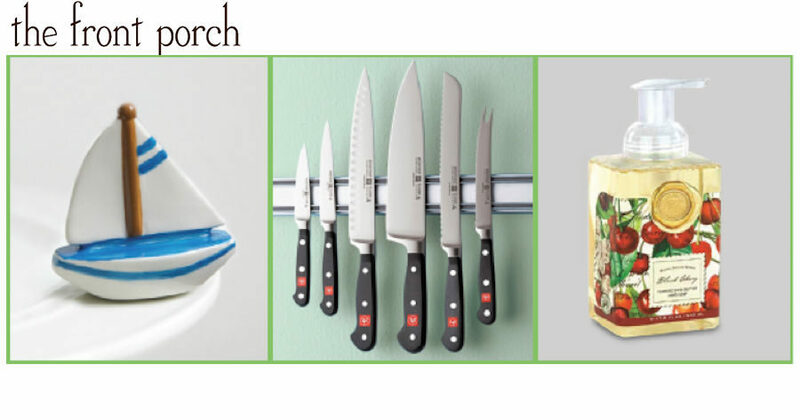 After moving to Suttons Bay in 1978, it has since become the Up North kitchen store and go-to gift shop for unique yet useful items for everyone in the family. “We are so grateful for what Eggert’s started,” says Amy Peterson, co-owner since 2005 with her husband Brad. The Front Porch will celebrate with refreshments and freebies for all and extensive sales throughout the store. For more, visit frontporchsuttonsbay.com and follow the shop on Facebook.